Sometimes during the Christmas season, I feel and act like the Gingerbread Man. I am running, running as fast as I can. But I am not running away from things, I am running to keep pace with my to-do list. Know the feeling? The running can be fun–exhilarating, exciting. However, if I keep it up, panic sets in. I begin to feel that I am losing my sense of what matters; I am losing my sense of me. I need to step away from my list, sit down, and just be loved. 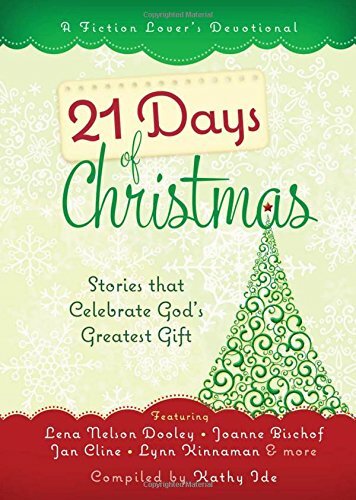 Reading 21 days of Christmas, compiled by Kathy Ide and published by BroadStreet Publishing Group, LLC (2015) is like sitting down in your favorite chair with a cup of hot chocolate (tiny marshmallows melting into creaminess) and breathing, just breathing, life back into your being. The 21 stories from 21 writers have various themes and settings (first century, 19th century and contemporary). The stories all take place at Christmas and explore life at this time of year with its joys and its real challenges. For example, one story looks at a young wife whose military husband will be away for the holidays. Another lets us listen in on the questions Joseph may have had about being the father of the Son of God. Another story shows a young teen hoping for a place to belong. The stories are brief, under ten pages. Each story is followed by a short reflection (Life Application) that connects with it and takes the reader deeper into the story’s theme. These reflections will give you something to think about and something to savor. I like it that 21 Days of Christmas is an anthology. I love hearing the voices of the various authors. Reading their stories, with different circumstances and different settings, gives me a rich sense of the community I belong to and the breadth and depth of God’s love for us all. So . . . anybody else for hot chocolate for the soul?